A revolutionary new concept in testing sugar in table grapes with application to wine grape growers. 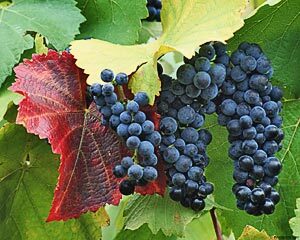 Table grapes must be harvested at the right time. If grapes are harvested too early, the inspectors could reject them, and if are harvested too late financial loss could be the result, due to decreased price against time. With the lack of an alternative method, producers worldwide use the "tasting" method to determine if grapes are ready or not to be picked. This method is unreliable, uncomfortable and unhealthy. But not the world-wide-patented Brixmaster is offering a solution to these problems. 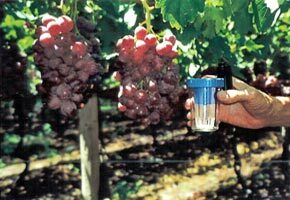 The Brixmaster is a device that accurately determines the sugar content of grapes. 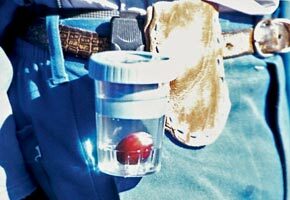 The Brixmaster gives the picker an immediate indication whether to pick or to leave the grape bunch under test. To determine the sugar content, the Brixmaster uses a simple, innovative method, namely the SG of the grape together with a special buffer solution. Because of the simplicity and low cost, each picker can now have his or her own device to an "infield" sugar test. An innovative device that "takes the trouble out of tasting." Durable, will last for many years. Harvest time can be earlier as the Brixmaster is ideal for selective picking. 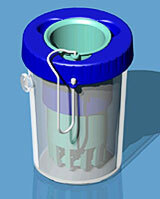 Replace the tasting method with a hygienic, safe and reliable method. The Brixmaster is used extensively in South Africa. Distributors exist in most table grape producing countries.